Three reel video slots are not new in the gambling world, but players expect to get them only inside the land-based casinos. When it comes to playing online video slots, people expect 5×3 reel video slots, but this time, NextGen Gaming has brought the traditional slot machine in your Smartphone. 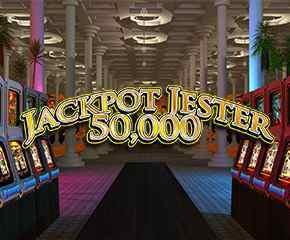 Jackpot Jester 50000 is a 3 reel video slot that can reward you 50,000 coins as the highest winning prize. Most of the players spend a quality time on fruit machines when they visit the land-based casinos. Many fruit machines are organized in a row to offer better gambling opportunities. NextGen Gaming knows that experienced players still miss the thrill of real casinos that’s why it has developed Jackpot Jester 50000 to bring the real casino like feel with all its audio and video features. Yes, of course, you should try it. 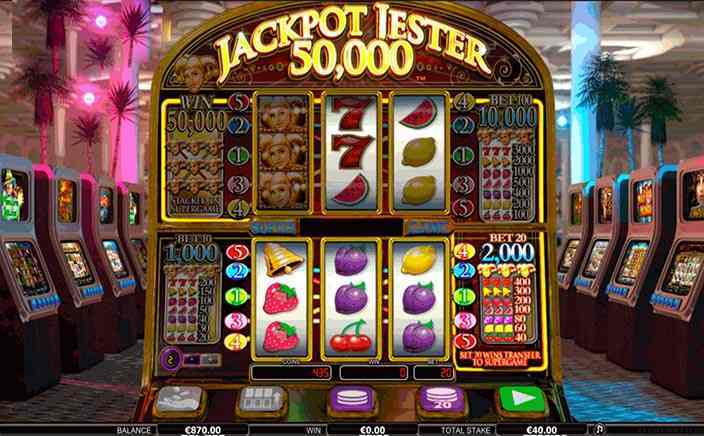 Jackpot Jester 50000 is based on old slot machines, but it is an exciting video slot. What makes it different from other video slots is its Vegas-style backdrop. You can see many other traditional style slot machines set in the background with Vegas palm trees. NextGen Gaming has tried to give you a Vegas casino style slot game and undoubtedly it succeeded in doing that. It looks like two different fruit machines with 5 paylines are set above one another. The symbols in this video slot will be quite familiar for professional gamblers, which features 7s, cherries, plums, lemons, a bell, and melons. The wild symbol is represented by Jester that plays a vital role for your win of 50,000 coins. Jackpot Jester 50000 gives you two betting choices, either you can play with 10 coins or 20 coins. 20 coins’ bet will help you in winning the jackpot prize and the Super Game feature helps you in meeting your goal. Jackpot Jester 50000 features no bonus game, but still playing on double reels would be a great fun. The lower reels operate during the base game and function like Vegas style 3-reel, 5-betline slot machines. If a player bets with 20 coins and wins, the winning amount is shifted to an upper slot machine. Now you can either start spinning the upper reel by betting with required amount or just store the prize in your gaming account. You will need 5 times larger amount to gamble in the upper slot machine and the winning prize would also be quite larger than lower slot machine during the base game. Jackpot Jester 50000 lures players to play the Super Game in the upper slot machine, but chances of losing the prize you already have also increased here. NextGen Gaming is famous as the producer of video slots with innovative bonus features. Its attempt to bring traditional slot back in trend is admirable. This video slot features familiar gameplay with an amazing jackpot prize.